This tent will change the way we think of camping! You have to see this! Isn’t it about time camping tents got an upgrade? It seems like tent design has remained the same for a long while now. This design makes up for lost time though. 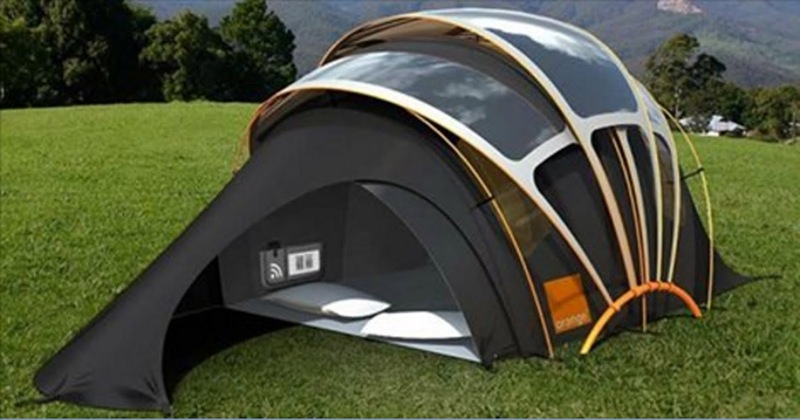 It’s called the Orange Solar Tent and it combines the classic small and portable tent aesthetic with solar power capabilities such as actually being able to charge electronics. The design was by the U.S. based design firm, Kaleidoscope, and they hooked up with a UK telecommunications company called Orange Communications. The vision is now brought to life and the tents are being implemented at music fests, like the Glastonbury Festival in the UK. These can have a much further reach though as they could be used by those going on camping trips, not to mention they would be great for providing comfortable shelter with power for homeless individuals. They definitely will get young people outdoors more as they will be able to charge their phones right inside their tents! SHARE these cool tents with all your friends and family!